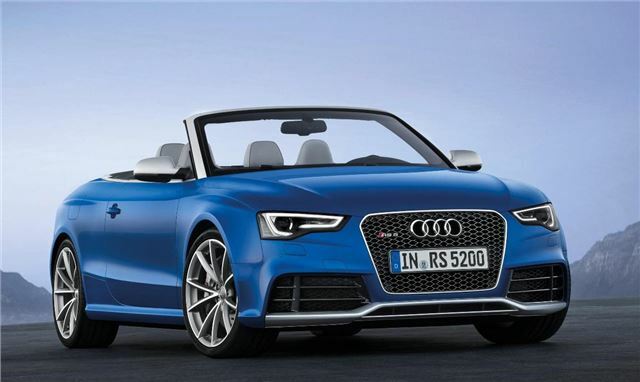 The folding fabric ‘acoustic hood’ on the RS5 Cabriolet is insulated with sound absorbent material. It’s fully automated and can be opened in 15 seconds or closed in 17, at up to 31mph. When folded it takes up 60 litres of the 380 litre boot. Besides the folding roof, the RS5 Cabriolet gets the same styling treatment is as the coupe, with new LED running lights, as well as a carbon spoiler and bulging bonnet contours. The ten-spoke alloy wheels are 19 inch. The 4.2-litre V8 engine produces 450PS at 8250rpm, with peak torque of 430Nm between 4000 and 6000rpm. 0-62mph takes 4.9 seconds and top speed is limited to 155mph, but the limiter can be raised to 174mph. Fuel economy is 25.9mpg on the combined cycle. Audi’s quattro all-wheel drive is fitted and delivers a 60:40 split in favour of the rear wheels, but this can change depending on the conditions. Transmission is a seven-speed S Tronic system. The suspension is lower and firmer than a standard A5 Cabriolet, with larger anti-roll bars and ventilated brake discs. Options include Dynamic Ride Control, which stabilises the car when driven hard, and carbon-cermanic brake discs. Standard equipment includes Bluetooth preparation, cruise control, sat nav and iPod connectivity, head level heating and heated seats, as well as a wind deflector, rollover protection and a lighting package. Additionally, the full range of assistance options from the A5 range are offered, including adaptive cruise control, reversing camera and blind spot monitor.